Clay Floors in Dallas Texas is here to serve you with all your flooring needs. For over 30 years our clients have depended on us to assist them with taking proper care of those floors. Making sure your investment is protected, maintained, and repaired with proper installation and care is what we do. We love floor period. So that said, we answer a lot of questions from clients about which is the best type of flooring to use. Various flooring materials vary just as much as the setting for each clients floors. What is best may not be the right question to ask. We choose to think that it is which is the best type of flooring for you to use in each designated area of your residential, commercial, hospitality, or sports setting. Probably the most asked questions we receive is should we use Hardwood floors or carpeting? Both types of flooring materials have distinct advantages and disadvantages. While different living and working environments and and will certainly call for different materials, some features of carpeting and hardwoods are consistent across environments. That is what this article will review for you; and we believe that it will clarify some answers for you as well. So, let’s explore. One of carpeting’s best and essential attributes is its soft, insulating, and buffering by it’s nature. It naturally absorbs sound. It also maintains heat, which can be quite essential in colder environments. It is also comfortable for people regularly on their feet for extended periods, and it proves priceless in the case of slips, trips and dropped items. The Good Old 70’s Shag option – The bad news is that it’s difficult to catch carpeting at its ideal “peak.” Carpeting always goes out of style, so you may be forced to replace it several times as trends go in and out, and the look and feel of a living environment changes. Today’s products can be overwhelming, but if you begin by researching what is out there, then calling us to discuss particular options for your setting. New Carpet Smell = Chemical Cartel – New carpeting can be a health hazard. Modern manufacturing uses synthetic materials – what you smell in a newly carpeted room, or carpet shop – which can be hazardous to some with sensitivity in breathing like those with asthma or chronic lung issues. New carpets will leak for years, and new carpet installation also often uses chemicals which emit fumes. These too, may not be healthy, and may cause sinus or breathing problems for people exposed to them for extensive periods of time. 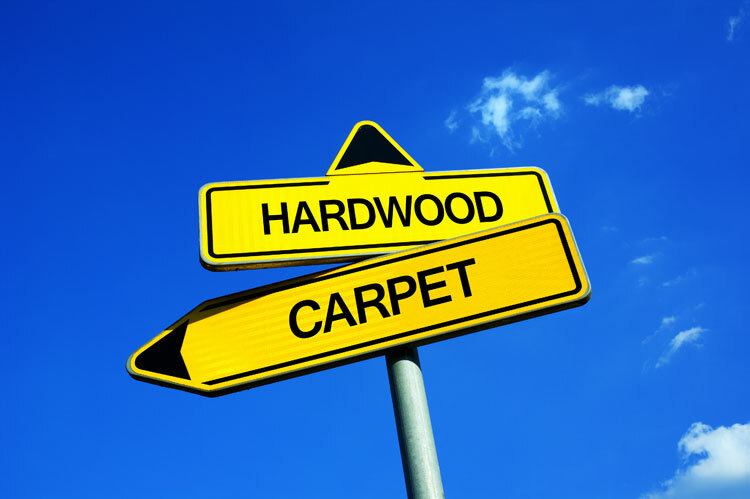 Natural, more eco-friendly carpets do exist, but they drive costs up significantly. You will need to be prepared for that. Modern technology has also made it possible to instill some permanence in carpeting, in the form of anti-fade color fastness, near-perfect stain protection, and even fireproofing. There will be specific types that can be used in commercial settings as well. City codes do vary quite a bit, so you will need to contact us about those situations. Carpet is considered a High Maintenance product. On the other end of the spectrum, carpet imminently deteriorates, and the more traffic it sees, the worse the effect. Many carpets can look ragged in as little as five years depending on its origin of fibers used. Carpets must have extensive cleaning, and may have minimal results – Carpets require regular intensive cleaning – daily, weekly, monthly and yearly, with extensive, expensive aids, chemicals and equipment. Most especially in commercial settings. The bad news is that they tend to be a one-way street. Given enough time and traffic, they will always matt and become increasingly difficult to care for. Allergy Nightmares do exist – In fact, for individuals who suffer from allergies, carpets could be a serious living nightmare. They’re a constant source of irritating dander, dust, fluff, fur, mildew, mold and pollen. Dust mites, especially, love carpet. While not all have severe issues, often times it can be enough to cause problems. Hardwoods Are Safe and Clean – As mentioned above, hardwood doesn’t hide harmful particulate matter, making for a healthier, safer living environment, especially for allergy sufferers. in general, hardwood floors cost more than carpeted floors, but they also require less maintenance, last longer and can be “repaired” (instead of replaced). Especially in older homes, hardwood floors can be draftier and colder. But a well-selected area rug typically remedies this problem. Usually Low Maintenance is required – Comparatively, hardwood floors require minimal maintenance – in terms of both effort and equipment. Consider, simply, the difference in price between a mop and vacuum. Hardwood floors are also much more resistant to spills and stains. With Quality cleaning products and equipment; like Bona which Clay for uses, these will extend the life of your hardwood floors. Hardwood floors do get scraped, scratched, scuffed, dented and damaged – especially in high traffic areas. However, wood flooring can most often simply be sanded, smoothed and refinished. It is rarely necessary to replace a wood floor. For Clay Floors, this is our speciality. Proper work over time greatly extends your valuable investment. Wood Flooring Is Sustainable – Since wood is a naturally occurring resource, which can even be reforested, hardwood floors may also be a quality ecological choice. Faster growing types of wood flooring materials – such as bamboo (which is actually grass) make this an even more plausible reality. Hardood Floors Are Unsurpassed Beauty and Value – Perhaps the number one reason to consider a hardwood floor is for aesthetic reasons. Considered one of the oldest flooring materials there is, classic wood flooring never goes out of style. Because of the large variety of trees and wood types, a world of colors, consistencies, designs, grains and patterns are available, the selection, style and finishes are truly innovative and sometimes hard to select because you love them all. Whereas many new homeowners will remove carpeting upon purchasing a house, viewing it as an additional expense, hardwood floors definitely increase the value of a house. So, hardwood floors may cost more initially, but with proper maintenance, they can be a sound investment that pay off for a lifetime. Keith Clay has been in business for 30 years serving Dallas, Frisco, Plano, Richardson and all Dallas Metroplex suburbs. We know wood floors and can answer any questions you may have. If you want the best job from a company of professionals, call us today. 972-463-6604. World Class Craftsmanship. Reasonable Prices.